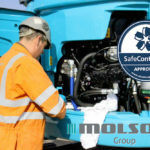 The UK’s largest independent equipment dealer Molson Group has been awarded SafeContractor accreditation. The SafeContractor scheme is a SSIP-approved health and safety assessment scheme for contractors who want to demonstrate that they’re takin­­­g responsibility for their legal health and safety requirements seriously. The SafeContractor scheme currently has over 30,000 active members and is widely seen as the badge of honour in demonstrating an organisation’s health and safety competency.